It is 1536. The north of England has boiled over into rebellion against Henry VIII and the rebels march south towards London, growing stronger by the day. Sixteen-year-old Nan Ellerton, sent home from her convent when the King's commissioners arrived, has been promised in marriage to a powerful lord. When both he and his son Francis become embroiled in the revolt, Nan must choose - help the rebels, even though it could mean paying the brutal penalty for treason, or betray her beliefs and risk eternal damnation. 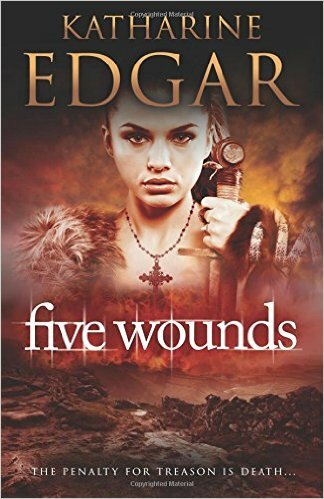 A stunning historical novel for teenagers from debut author Katharine Edgar, Five Wounds tells a story of adventure, passion and courage, set against the backdrop of the Pilgrimage of Grace.